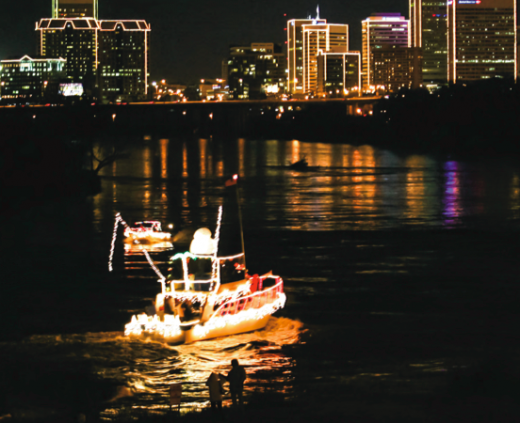 Each year, boaters decorate their vessels and take to the river at dusk in a dazzling spectacle of lights. The James River Parade of Lights, which is sponsored by the James River Advisory Council, is one of the region’s most cherished holiday events. Spectators line the shorelines at several official viewing sites to take in the parade and other festive entertainment. The parade begins in Richmond, just below the fall line, and the boats cruise through Henrico and Chesterfield counties to the Varina-Enon Bridge. Libby Hill by the Confederate Soldiers’ and Sailors’ Monument is a great place to see the boats and lights!